With the new Spousal Sponsorship Process having been formally rolled out, it is a good time to look at the changes and share some insights about what I like, what I dislike, and what I’m curious to know more about or see in-action moving forward. I will defer to IRCC and their handy charts and guide to explain how things have changed. My understanding is that the focus on the new process was on eliminating unnecessary or duplicating forms, reducing the length of guides and other forms, and changing around the order of the process to avoid new medical requests or expired police certificates that would delay applications. Importantly, for applicants, the processing times are projected to go down to 12 months for 80% of applicants. 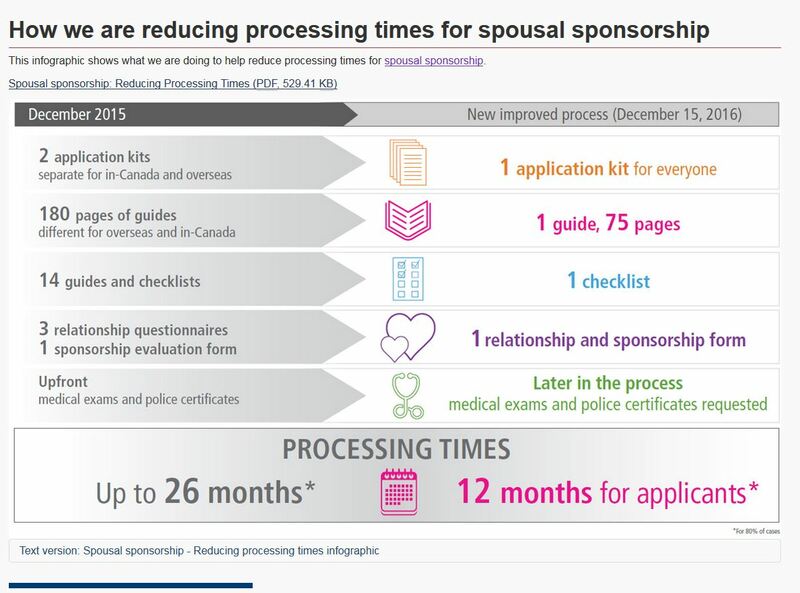 Prior to these changes, as illustrated, in-Canada applications and applications at select visa offices abroad took longer to process, many times 26 months and beyond. Indeed, one of the major incentives for individuals who lived in Canada with status was to still pursue the Outside Canada process was that decisions would be made faster than they would inside Canada while preserving appeal rights. I like the movement of medicals and police certificates to the back end. I also like the fact that less forms are required. Within the forms, there is less requirements for supporting evidence and now Applicants will be limited in the number of pages of documents and photos they send in. However, I think that it will be useful to add more clearer instructions to applicant to begin gathering those documents well in advance. In some countries, the police certificates can take several months to obtain. These certificates could then delay the process well over a year. The reality is, the police certificate process is more onerous in countries with stricter governmental controls over information or increase bureaucracy/control around individual movements. In these countries, there is the added challenge of getting adequate translations or certificates that all can rear their ugly head into the process. The creation of one set of instructions (rather than two) in mind is a positive factor. Instructions are now much clearer – aesthetically and in terms of content. The revised Document Checklist (although requiring more filling in) is now split into one for spousal sponsored spouses and one for common-law sponsored spouses. I still suspect (in the transition period) a little confusion over the two out of three and three out of four requirements in the above forms. Reading the fine-print becomes even more important now. 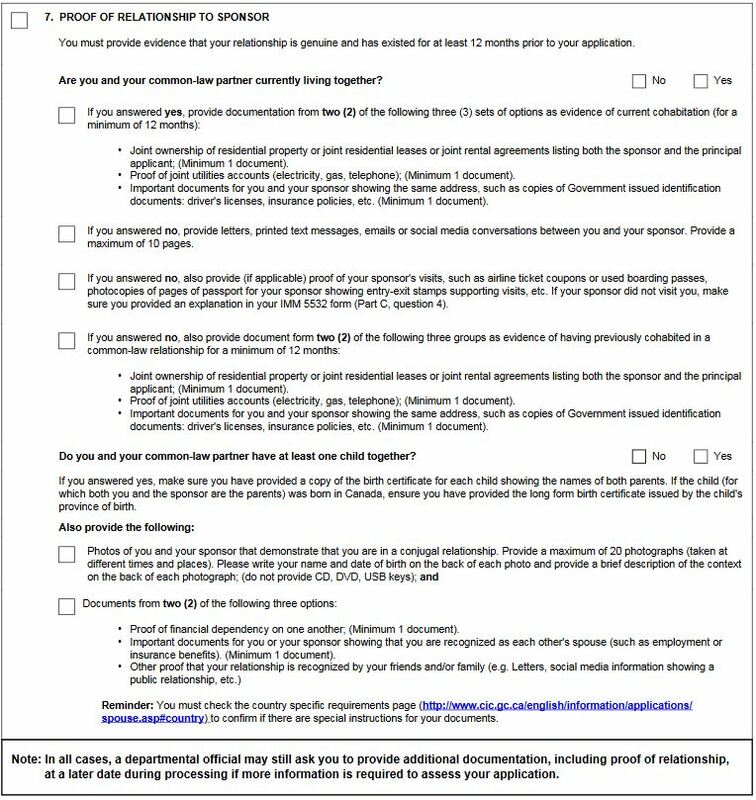 It will be interesting to see how this affects completeness of application (see below) and also whether documents will be rejected for not entirely meeting one of the criteria and thus necessitating a whole new requirement of additional information. Specifically, proof of important documents showing same address seems very broad. The guide is also promising four month processing which is an improvement on the six months (and often longer) that was the earlier standard. 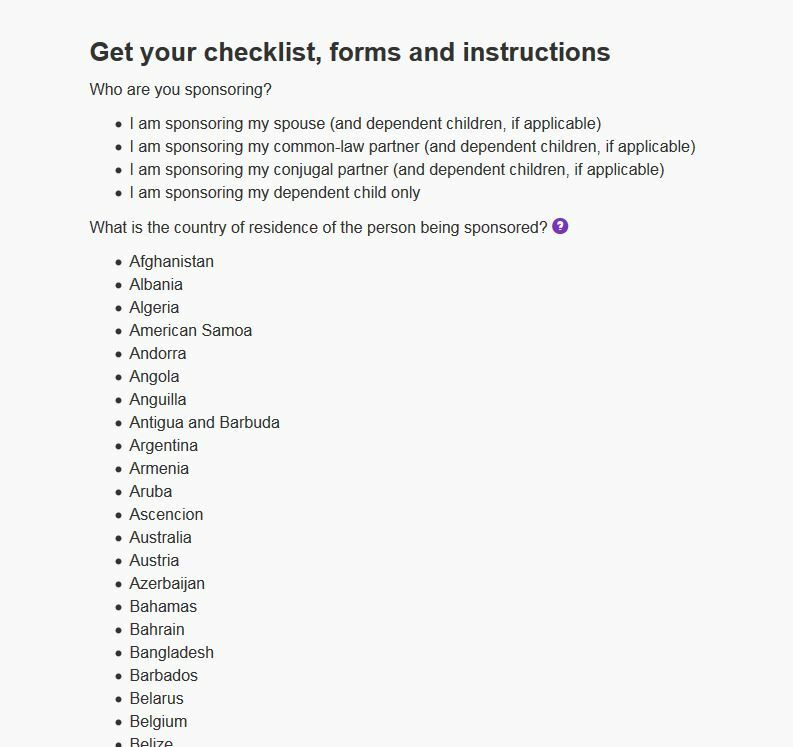 As you may have read from my previous pieces, I am a huge supporter of more bridging options and the fact that all spousal sponsorship where the Sponsor has been approved should facilitate some sort of visa to allow temporary reunification. Immigration, Refugees and Citizenship Canada (“IRCC”) has two guides out – Guide 5525 (the “Basic Guide”) and Guide 5289 (the “Comprehensive Guide”). The Basic Guide essentially attempts to summarize the information in the Comprehensive Guide in an shorter/easier to read format. As my good friend and legal colleague, Ronalee Carey, points out – there is a lot left out in the Basic Guide which if relied upon without consulting the Comprehensive Guide can create major problems. She highlights the fact that the basic guide ignores the exemption for Minimum Necessary Income pursuant to R. 133(4) of IRPR. She also highlights the way that it is not accurate/nor clear when an individual should be applying outside Canada or inside Canada, specifically where an individual has legal status in Canada (student, worker) and can apply outside Canada for the purposes of preserving appeal rights and possibly seeking faster processing at a less-burdened outside Canada office. This issue appears to be repeated in the forms. I would suggest however that even in the interest of space, it is important to re-iterate that the decision of which process and the consequences are much more important as we discuss immediately below. This is likely the biggest issue I see with the new system. 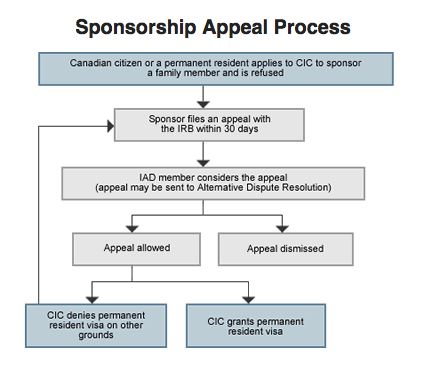 As per OP 21 – If a Canadian citizen or permanent resident makes an application to sponsor a foreign national as a member of the family class, and the application is refused, the sponsor may appeal the refusal of the application to the IAD [A63(1)]. The sponsor must be given the reasons for the refusal and also told of their right to appeal the decision to the IAD. If IRCC were to go very strict and start refusing inside Canada applications for misrepresentation or even rejecting/refusing applications for genuineness or document sufficiency, these applicants (or their sponsors) would be limited to judicial review or seeking reconsideration. I believe that there are still very real reasons to apply for the outside sponsorship process while inside Canada that are not explored in the instruction guides as they currently stand. However, in my opinion it is not enough. Very few applicants I talk to know about IP8 – Manual and have read the public policy (pages 64-79). I think there should be a greater onus on IRCC to educate on a very important provision. 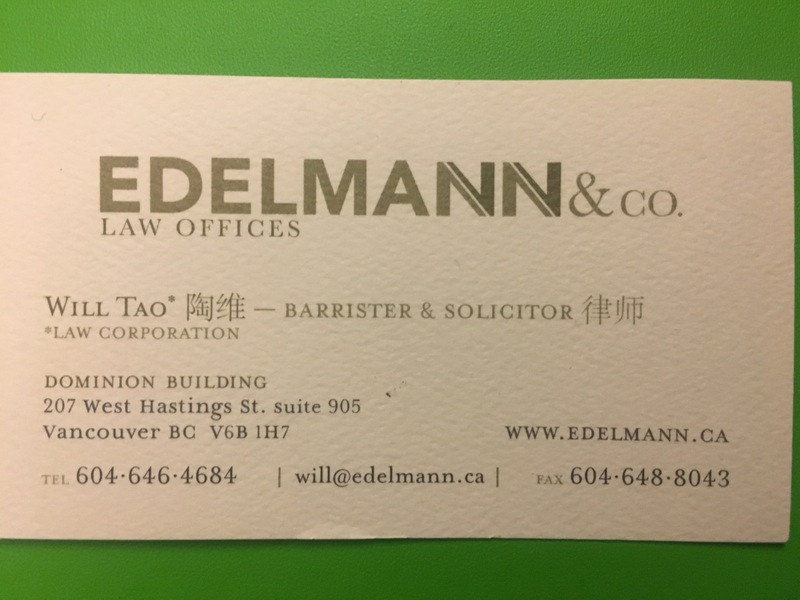 In fact, in a case I dealt with last year, the Call Centre instructed an inside of Canada spousal applicant who was out of status to turn himself into the Border, a move which would have been devastating for their future in Canada. 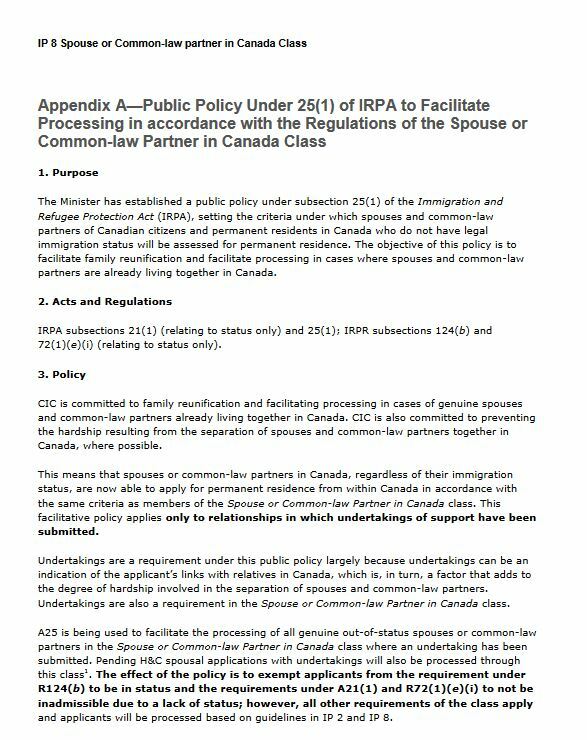 There needs to be clarity on “out of status” spouses for inside Canada to be more effective, particularly in the stricter manner in which they are assessing application completeness (see below). Normally, I would put something like this in the “to-be determined” category, but my predictive wisdom tells me that if Express Entry and the eTA are any indication, there will be major issues with linking accounts and the receipt of email documents. One of the changes is that the Schedule A is now being moved to a mid-processing requirement, requested after the linking of a paper application to the electronic system. I have seen linking issues time and time again delay Electronic Travel Authorizations and Express Entry Applications. It will become very crucial for applicants to accurately and adequately keep record of what they submit for their sponsorship and at the very minimum keep a copy of their physical application. Also, with technology even the type of internet browser used can affect the process. IRCC has indicated that it will take a stricter approach to returning incomplete applications and have emphasized that in order to meet processing times, they may not be as generous with making information requests. If Express Entry is any indication (where early estimates in the first year of roll out were that in the bull-park of 25% of applications were returned as incomplete), this could be a serious problem. This is particularly true for out of status spouses in Canada or where a refusal will leave a client out of status. Again, I think more clarity needs to be introduced clarifying the completeness check process for spousals and also what an out of status spouse can do in the circumstances. I can see very real situation where an Applicant submits only 3 out of 4 where the documents require 4 or prove only 1 out of 3 instead of 2 out of three of one requirement. 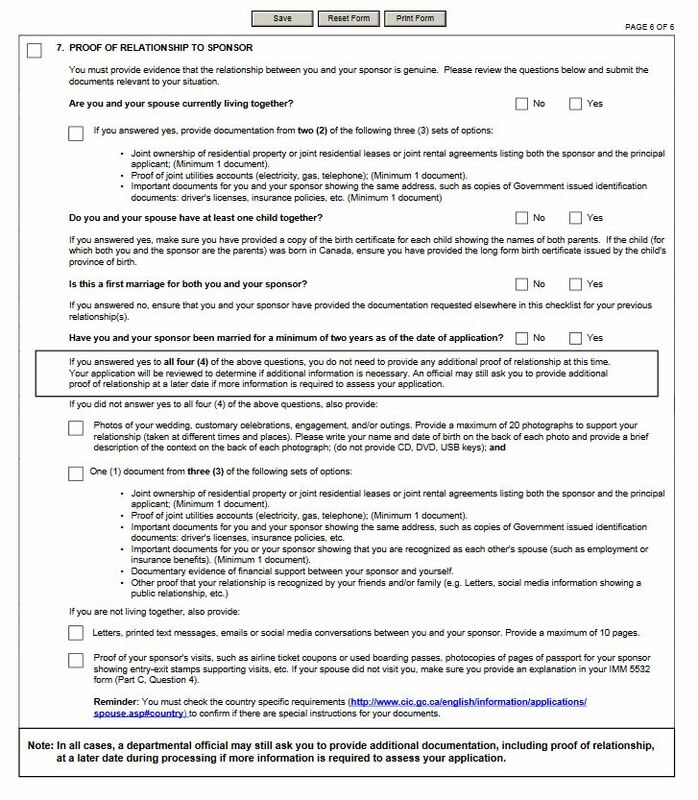 If they mail this application in, they may only find out months later when the individual then begins to run into status problems. Is an application where the individual sends more than the required documents considered incomplete and returned? How strictly will some of the requirements be enforced? Who Falls into the 20%? It will be interesting and I hope IRCC does some tracking to see what type of applicants fall under this – if specific nationalities or visa offices are not meeting their targets or if specific type of relationships (long distance, inter-nationality etc.) trigger delays more than others. The fact is that many visa offices will follow-up with much more onerous documentation requirements. For example, Hong Kong asks not for a 10-year personal history but for a personal history since the age of 18. Many relationships that I see now begin with a Canadian having met the accompanying spouse while living/studying/visiting/working abroad. They marry early, based on their inability to spend time with each other and a source of commitment to each other, and finally they try and apply visas which get refused for inability to demonstrate dual intention. It’s a cycle that is very difficult to break with subsequent re-applications. Online relationships are more frequent now. There may be a meeting in-between, but the entire relationship cannot be understood in 20 pages or 10 pages. How are these relationships going to be assessed, particularly inside Canada? These marriages are understandably difficult to assess. Interviews (performed abroad) are high stress and particularly unrepresented applicants are wholly unprepared for the type of questioning that often can occur. For those 20%, this new process may give them less opportunity to front-end proof. My hope it is that visa offices will give increase procedural fairness, but that will have to be seen as the system rolls in. How will Temporary Resident Application Increases and Public Policy Cases Affect the Overall Immigration System? What Happens When In-Canada Gets Backlogged Again. I recently applied to sponsor my wife. She had valid student status in Canada for a year (which we looked to extend) and for us avoiding the in-Canada backlog was the primary motivation. Hong Kong has been historically processing sponsorship applications quite fast and while we wanted in-Canada processing we weren’t surprised or disappointed. The way the new program is being marketed, there is absolutely an incentive created towards applying in Canada. For those with Electronic Travel Authorizations (“eTAs”), I would suspect more visits to Canada first and then applications inside Canada. For those applying outside Canada, I would suspect many would want to seek study permits or Temporary Resident Visas (“TRVs”) first and then apply while in Canada. There is some talk that eTAs are now becoming must stricter for married spouses, similar to the challenges of getting a TRV once married. There are also consequences of refusal. Where a self-rep does not understand the rules or submitted a deficient application and could use H&Cs to overcome the rules, now the only path is judicial review, where H&Cs have little to no relevance on the overall decision other than establishing the factual basis of the impugned decision’s reasonableness or fairness. I also expect a whole slew of new Document Request letters emailed/mailed but not received cases that could make for interesting litigation and arguably reshape the IRCC’s processes for collecting documents from clients. Finally, with incentive, also comes the possibility of abuse. 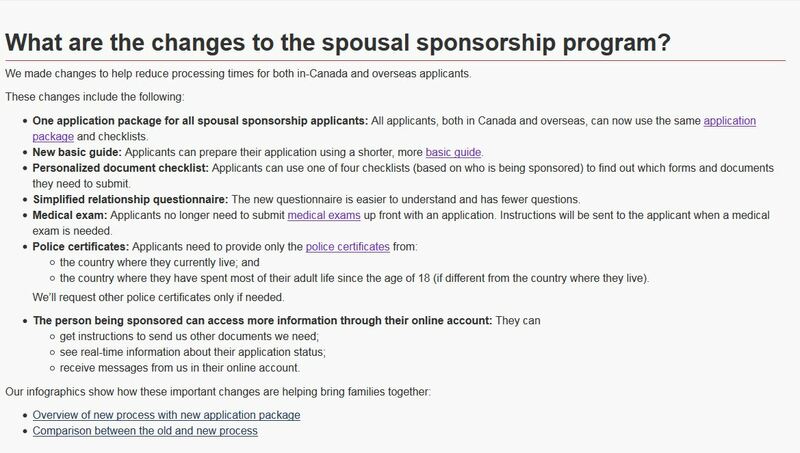 The situation we do not want to see, from the standpoint of legitimate Canadian couples, is an influx of in-Canada applications used as extensions for temporary statuses, where the promoted option should be to file the extension on it’s own merits and proceed with an outside Canada sponsorship. 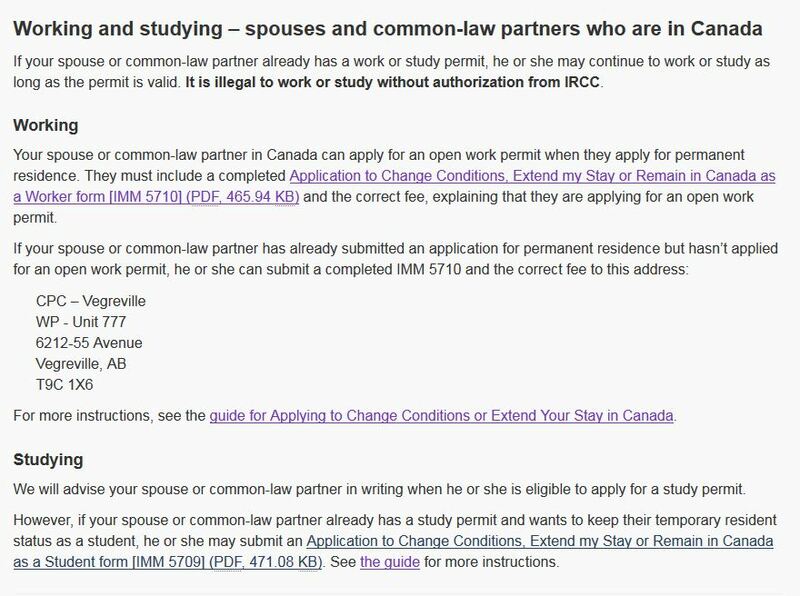 From an A40 misrepresentation front, more needs to be done to ensure those who are practicing immigration are not creating immigration pathways based on non-genuine marriages/common-law partnerships designed to keep applicants inside Canada. It will take some getting used to and a lot of reading but I generally like the idea of making processes more user-friendly and the idea of better tracking for Applicants (e.g. the use of cellphone confirmations that applicants were received). I like shorter guides, only so-far as they don’t omit important information. I think right now it does omit important information. I would stick to one guide and cut the concept of a Basic and a Full. The legitimate expectation of applicants will be that both are the same and one is equivalent to the other, which can never be the case when trying to summarize important information that is all relevant. I look forward to seeing faster processing. Yes, I might be a little bitter that I did not apply in-Canada myself (if only I waited a month! ), but I still think competent visa offices abroad play an important role in assessing a relationship and where appropriate need to step in to play investigative roles. It’s unclear how this can or will be done when in-Canada applications become the norm. Can I Lose My Open Work Permit If My In-Canada Spousal Is Refused? 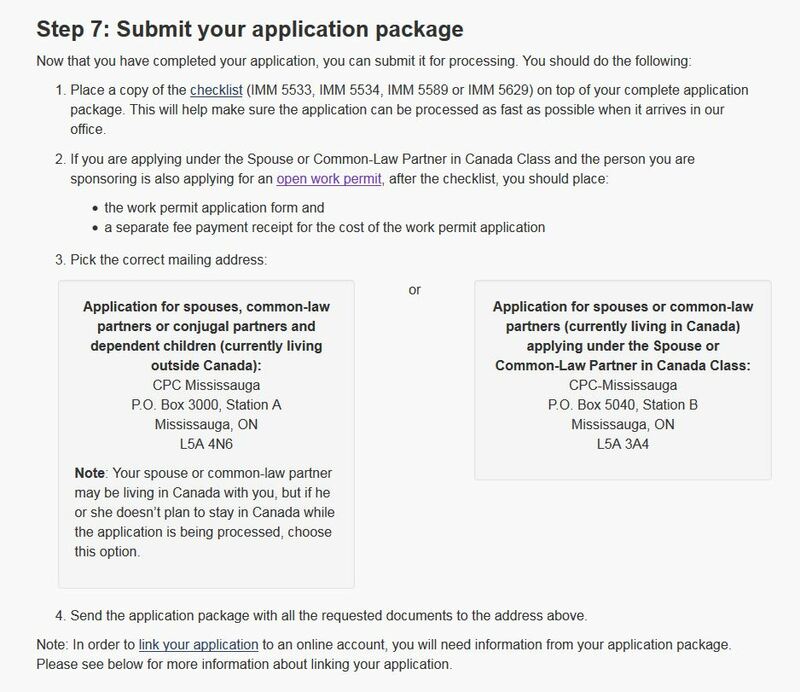 As a relatively new (December 2014) immigration program, the One Year Pilot Project which provides an Open-Work Permit to In-Canada Spousal Sponsorship/Common-Law Applicants raises many interesting factual scenarios – particularly in relation to refused applications. Under this pilot project, prior to first-stage approval, Applicants who currently are in-status and in Canada are given open work permits allowing them to work anywhere in Canada while their spousal/common-law applications are in processing. I was asked an interesting scenario, one that was brought up by the folks in the Canada Spousal Sponsorship Practitioners Facebook Group. What if an in-Canada Spousal Application is refused? Can the individual continue to hold and work on their Open-Work Permit. (c) on cancellation of their temporary resident permit. Applying Section 47 of IRPA, there are currently no grounds to require a foreign national holding a open spousal work permit to leave Canada because the Spousal/Common-Law Sponsorship application has been refused. When does the authorized period to remain in Canada end? (d) the day on which the period authorized under subsection (2) ends, if paragraphs (a) to (c) do not apply. (b) the end of the new period authorized for their stay, if the application is allowed. (5.1) Subsection (5) does not apply in respect of a foreign national who is the subject of a declaration made under subsection 22.1(1) of the Act. (6) If the period authorized for the stay of a temporary resident is extended by operation of paragraph (5)(a) or extended under paragraph (5)(b), the temporary resident retains their status, subject to any other conditions imposed, during the extended period. (b) in any other case, the day on which they enter Canada. On my reading, as long as the Applicant has a valid temporary resident visa allowing them to re-enter Canada, they cannot lose their open work permit simply by leaving Canada. This is not a case of implied status. There are several potential opportunities created by a foreign national spouse-applicant who holds an open work permit. There may be several economic options worth pursuing if the required work experience can be obtained. Also, an Overseas application can be initiated and the ability of the individual to travel back to their home country can facilitate any officer interview conducted overseas. However, given the current uncertainty with Port of Entry examinations and Officer discretion leaving Canada while holding an Open Spousal Work Permit and a In-Canada Spousal Sponsorship refusal may not be the most desirable choice. 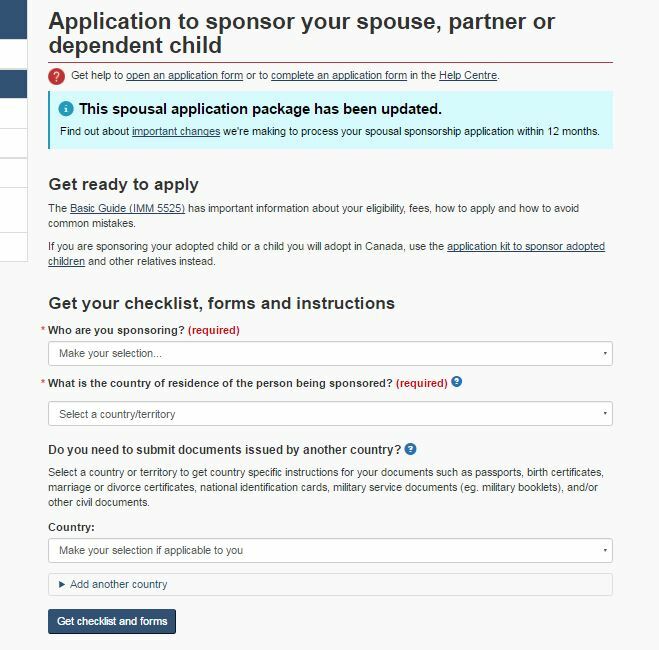 I think Citizenship and Immigration Canada has really shot itself in the foot with making the open work permit option only for In-Canada Spousal Sponsorship applicants. 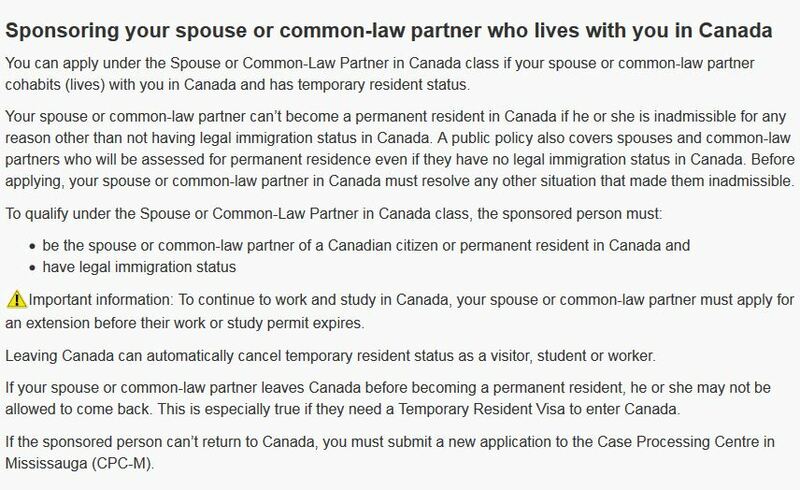 Should this option exist for Overseas applicants as well (who by the way can be in Canada when applying). If there did so there would less of a burden and backlog of the domestic system – currently holding up families for 26 months +. While well-intentioned, the Open Spousal Work Permit has become an emergency lifeline for Canadian couples with a foreign national spouse/common-law partner. It creates the potential for poorly prepared applications filed to save a relationship. If I were CIC I would encourage more individuals to apply abroad, put more resources abroad to boost those processing times, and encourage more spouses to stay and work in Canada on a dual-intention pending processing of their Sponsorship applications.